NX-1000H/V can be changed from vertical to horizontal format; seals PE, PP and layered barrier bags to 2 x 250um thick. Equiped with Automatic Temperature Controlling Device controls (0-300 deg. C) with 5 min. warm up and 10min. cool down. 125 x 720mm conveyor has adjustable tension and speed (0-12m min.) 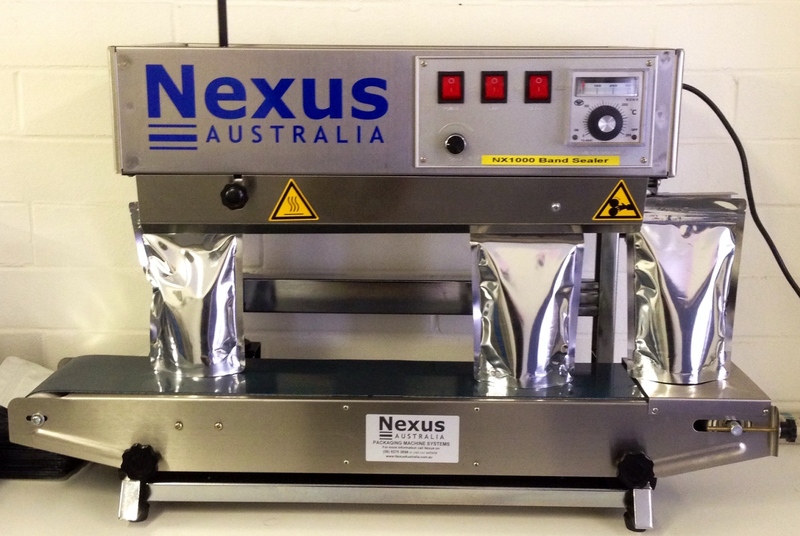 Bag height - sealing head to conveyor (vertical format) 140mm to 320mm. Bag length - sealing head to outer edge of conveyor (horizontal format) 100mm to 400mm. Adjustable sealing pressure via control knob to suit various film thicknesses. Optional imprint kit. Also NX-1000H is the same as NX-1000H/V but fixed in the horizontal format.